Bedwetting is a baptismal name for urinating while asleep in bed. It is also known as nocturnal enuresis in a bogus grandiloquent parlance. This singular act is common in children. In other words, it is normal in children in a way that a French could nod and say: C’est normal. But when a grown person between the ages of ten and above continues to bedwet, a typical French won’t have the guts to say that it is normal. In my neighbourhood, there is a case where a married man has bedwetted since childhood. Hey! Don’t think it, his wife abides by her marital vows: for better or worse’ and gives the hubby diapers. Genetics. One of the first places to look for causes of urinary incontinence is whether there is a family history of bedwetting. Checklist question: Did or does any of the bed-wetter’s parents bed-wetted? If yes, then, eureka! Urinary tract infection (UTI). This a case where the urethra, the urino-genital express road in a man’s joystick is infected and can no longer control the discharge of urine. Example, if during urination, the person cannot cut and resume at will. Alcoholism: Many drunkards bedwet. Having lost their sobriety to alcoholism, they urinate whenever and wherever the urge comes. This condition is even worsened by frequent urination that follows intakes of alcoholic drinks such as beer. 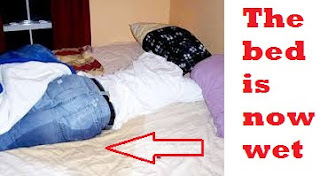 Urinating in Dreams: Most times, dreams are acted out in reality. One of the actions in dreams that one could act out in reality is urinating in a dream. You could suddenly feel pressed in your dream, perhaps while you take a walk with your friends and you excused them to ease yourself. While peeing in your dream, your pants might get drenched with real urine. Parental Indifference: We have said it that bedwetting is common among children; and that it is normal. It is simple; it is one of the animalistic tendencies available in men at birth. Via socialization, children are toilet-trained first and later urine-trained especially by the parents, nay the family in their primary socialization role. Indifference to this role by parents could lead to persistent bedwetting into adulthood during which time it could be difficult to correct. Be these as they may, adult bedwetting is correctible medically, psychologically and practically. The choice of any of this should be based on the identified cause of the urinal incontinence. Sufferer of this problem should not be stigmatized. Observation has shown that stigmatization only worsens the matter. Now, is any of these reasons true about a bed-wetter you have known?